After Saturday’s 49-24 win over UConn, UCF came in at No. 15 in the third installment of this season’s College Football Playoff rankings that dropped on Tuesday night, moving up from No. 18. There were eight two-loss teams ahead of the Knights in last week’s rankings. But over the weekend, there were some shakeups around the college football world. That allowed Scott Frost’s team to move up three spots into the top 15. They are just two spots away from being the highest-ranked Group of Five team ever. Memphis was No. 13 in 2015. 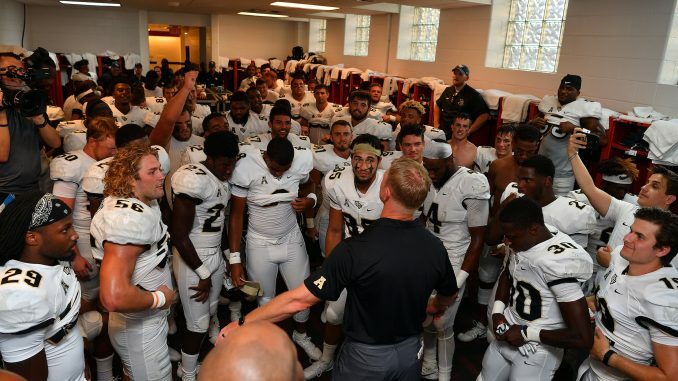 The Knights (9-0, 6-0 AAC) are one of just four undefeated teams left in Division I. There are still seven two-loss teams ranked ahead of them, and the next-lowest undefeated team is Wisconsin at No. 5. UCF debuted at No. 18 in the initial rankings, then stayed in the same spot last week despite a road win over a solid SMU team. The Group of Five’s New Year’s Six spot would belong to the Knights if the season ended today. The other Group of Five teams in the committee’s rankings were Boise State (No. 25) and Memphis (No. 21). UCF heads to Temple (5-5, 3-3 AAC) on Saturday before returning to Spectrum Stadium on Black Friday to host USF (8-1, 5-1 AAC).